The Sutter Lawn Swimmer is an unofficial and decidedly unauthorized Internet newsletter and remembrance for the alumni of the Sutter Lawn Tennis Club Swimming Team of Sacramento, Calif., in the 1960s and early 1970s. Information presented here is based on reports from persons who are generally considered to be reliable when sober. Buzz Nolan, the swim team coach, serves as interim webmaster until he can con somebody with real website talent to take over the duty. only promise that the Sutter Lawn Swimmer aims to celebrate the enduring bonds of friendship and fond memories of good times together in the pool and on the pool deck at Sutter Lawn. Please send additions, corrections and information on the whereabouts and activities of former SLTC swimmers not currently enrolled in a Witness Protection Program to Buzz for future posting. Photos are especially welcome. His email is lewis_nolan@yahoo.com. Snail mail address is 196 North Highland, Memphis, TN 38111. Telephone is 901-3217-8845. Instructor Bob Reid (wearing shirt at right), about 1962.
meet in Sacramento, California about 1962. Swimmer of the Year Trophy at Sutter Lawn Tennis Club. It was one of the few swimming trophies from the early 1960s that have been preserved by the club. Visiting their old haunts there in April, 2005 were former Swim Team Coach Buzz Nolan, Assistant Coach Bob Reid and onetime outstanding AAU age group swimmers Peter Anderson and Beth Leonard. Wearing a Sutter Lawn Tennis Club swim team racing suit (by Speedo) at right is team coach Buzz Nolan. He and fellow SLTC member Pete Siller were at Folsum Lake for a deep dive in the freshwater lake near the infamous prison. Shortly after this photo was taken about 1962 they donned Scuba gear and wet suits and descended to a depth of 100 feet, a personal record for both. On occasion Buzz used his diving gear in the Sutter Lawn pool for underwater maintenance chores. Buzz and Pete were fraternity brothers at Sac State. Pete later was killed in Vietnam. 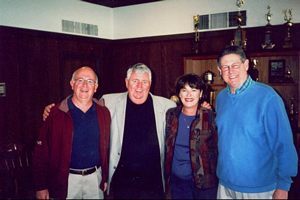 (From left) Peter Anderson, Buzz Nolan, Beth Leonard and Bob Reid by trophy case in clubhouse at Sacramento's Sutter Lawn Tennis Club. Peter and Beth were outstanding AAU age group swimmers on the club team in the early 1960s. Buzz, who swam on the varsity team at Sac State, was head coach. Bob was assistant coach and head lessons instructor. Buzz was back in Sacramento for a college fraternity reunion in April, 2005, and got together with the others to remember some great times over dinner and a visit to the club where all spent so many happy hours in the pool. Buzz has lived in Memphis since 1970. Bob Reid (left) clowns around with Buzz Nolan, whom he nicknamed "The Prince"
on the varsity team at Sac State, was head swimming team coach. Bob was assistant coach and head lessons instructor. Buzz was back in Sacramento for a college fraternity reunion in April, 2005. Now retired from Schering-Plough HealthCare Products, which he served as vice president communications, he has lived in Memphis since 1970. He enjoys travel with his wife of 37 years, Betty. Travelogues and photos about their trips to Europe, the Caribbean and cross country drives in the U.S. are posted at a hobby website, nolantravels1/. On his most recent and previous visits to Sutter Lawn over the years, Buzz found that the most of the club's facilities and layout haven't changed much. But many of the swimmers he coached have children of their own now. His son, Casey, played on the water polo team at the University of Virginia and later competed in numerous triathlons on both coasts. Bob Reid revisits pool where he and Buzz Nolan worked at Sacramento's Sutter Lawn Tennis Club in the early 1960s. Bob was assistant swim team coach and head lessons instructor. and became a VP/Commercial Lender at Irwin Union Bank's Sacramento operation. In June, 2005, she and Ed Schatz married and she took his name. They are building a home in West Sacramento. In September, 2005 Peter retired as Chief Consultant for the Assembly Republican Office of Policy in the California State Legislature to become the Pharmaceutical Research Manufacturers Association's State Policy Directory for California. He has been married for 25 years and has a son and a daughter, both high achievers. lessons. Buzz said years later that economics kept him from making coaching young swimmers his life's work. His career path took him into newspapers and then corporate communications. Bob was in and out of professional club and event management for several years and eventually served in high positions in California state government. Nancy Mee relaxes in Downey, Calif., where her family had a second home, in 1965. She gave the photo to her swimming coach, Buzz Nolan. Nancy was an outstanding swimmer and ferocious competitor who dominated the 50-yard butterfly event in her age groups while swimming for Sacramento's Sutter Lawn Tennis Club swim team in the early 1960s. She later became a world-renowned sculptor who works in glass and lives in Seattle, where she and her husband have a studio. Marc Rush (left) and Billy Stillwell by new pool heater at Sacramento's Sutter Lawn Tennis Club about 1962. Both were outstanding AAU Age Group Swimmers. Marc's event was the backstroke. Billy starred in both butterfly and freestyle. Their relay teams dominated their age group events. Billy swam in college and coached an AAU Age Group swim team. He later earned a PhD and worked as a psychologist. He died in 1995 at the age of 45. 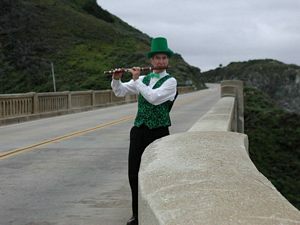 Marc is married and living in Pacific Grove, Calif., near Monterey. Betina Anderson (no relation to SLTC member Peter Anderson) and Scott Rush on pool deck at Sacramento's Sutter Lawn Tennis Club about 1962. At the time, Tina was the girlfriend of Swim Coach Buzz Nolan. Sutter Lawn Swim Team about 1965. Photo courtesy of Marc Rush (top row, 4th from right, now living in Pacific Grove), and Peter Anderson (top left, recently retired from longtime legislative policy position in Sacramento to become California State Affairs Director for the Pharmaceutical Research Manufacturers Association). mechanical typewriter and copied on yellow paper by a memograph machine. In exchange for coaching the swim team at no pay, Buzz and Bob had the use of the pool in the mornings for lessons. In a good season, they would make as much from the lessons as they did as lifeguards. Consequently, the team practices were held very early in the morning despite the grumbles of some swimmers and their parents. earning Buzz enough money to buy a second-hand-but snazzy, MGA convertible he drove to Ole Miss before rolling it and narrowly escaping death or serious injury in 1964. 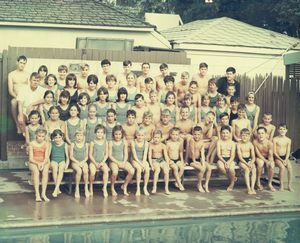 Sutter Lawn Swim team 1972 Coach Mike Chamberlain standing on deck at far right. Assistant Coach Mitch Toelle at far left. Sutter Lawn Swim team coach Mike Chamberlain by team and pool records sign in 1972. Boys 15-17 medley relay record still standing in 2005. 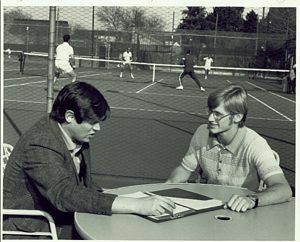 Sutter Lawn Tennis Club manager Bob Reid (left) confers with swim team coach Mike Chamberlain. Bob hired Mike, a former Hiram Johnson High School swimming star and a student at Cosummes River College, to work with him at Reid & Associates, a group of tennis and swimming professionals with a management contract at Sutter Lawn. Mike also taught lessons and lifeguarded. 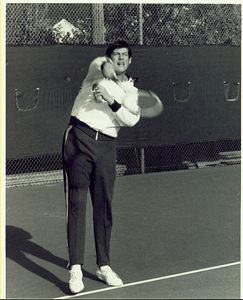 Sutter Lawn Tennis Club Manager Bob Reid demonstrates his powerful serve at the club in 1972. Bob formed a management group, Reid & Associates, and hired several tennis and swimming professionals to provide services to Sutter Lawn in 1971-72. He said more than 30 years later that, "It was not a great time in my life but at the time it seemed fun. I learned a bit about working with a board of directors and managing a staff." During that period the swim team won the league championship for the first time. Bob, who grew up a few doors from the club and spent much of his childhood there, had played tennis in numerous Sutter Lawn tournaments and also at the University of Oregon. After graduation, he served in some political campaigns and was appointed special assistant to the Director of the Peace Corps in Washington. His stewardship as manager of Sutter Lawn followed that of J. B. Cantrell, who had hired Bob and Buzz Nolan when they were teens. J. 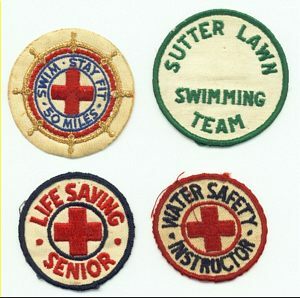 B. left Sutter Lawn to become owner-manager of the Carriage Raquet Club in Roseville, Calif.
top left was awarded him and several members of the swim team for swimming more than 50 miles over a period of several weeks as part of President John F. Kennedy's national fitness campaign. A chart posted on a fence by the pool deck kept up with each swimmer's progress toward the 50-mile goal. The Water Safety Instructor badge, also worn by SLTC co-pool manager and head swimming lesson instructor Bob Reid, is a hard-won, professional designation. The WSI designation authorized Buzz and Bob to teach Red Cross- certified lessons and issue various Red Cross certificates for swimming competence including that of Senior Life Saver, necessary for employment as lifeguards at Sutter Lawn. Peter Anderson with fraternity brothers This photo was taken at a wedding in 1973 and includes some of the members of Sigma Nu fraternity from the University of California, Davis. The groom is in the tux in the center and is now a federal agent in San Diego. The guy in the pink outfit on the left is now a very conservative, very successful attorney in Merced, California who frequently testifies at the California Legislature on major water issues. The guy with the long hair and beard in the middle rear is now an English professor at the University of Missouri. The blond guy in the right rear with long hair and glasses lived in a tree while attending UC Davis law school and finished 3rd in his class. The short guy in front of him in the blue suit is now an anesthesiologist in Lake Charles, Louisiana. And yes, the guy in the tux on the right is Peter. Peter Anderson with family Peter Anderson and his family sent out this family photo with a Christmas message in late 2005. Pictured are Peter, Judy, Chris and Jenny. sentences (or as many as you like) about your activities and any old memories you care to share and to send the report to Buzz Nolan for future publication in Sutter Lawn Swimmer. His snail mail address is 196 North Highland, Memphis TN 38111. 901-327-8845. Photos are welcome and will be returned. Private email addresses of former Sutter Lawn swimmers are not generally listed to minimize spamming but are available on an individual basis from Buzz, whose public address at lewis_nolan@yahoo.com seems to be on every spam list in the world. 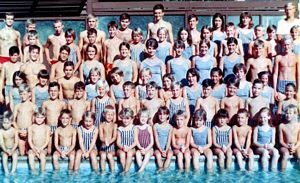 Marc Rush writes, "As for myself… I was a lifeguard at Sutter Lawn for a summer in 1968, swam for Sacramento High School with Bill Stillwell, Peter Anderson, etc. I was picked for the Individual Medley (as well as backstroke) as I had the best overall times for all the strokes. Never did all that well as I remember. Got to race against Mark Spitz and other future olympians when a few of us went on to the quarter sectionals. "I didn’t swim when I went on to Sacramento City College for a couple of semesters. I applied for, and was granted conscientious objector status by my local draft board in 1970 as the Vietnam war was winding down. Performed my alternate service at a California Division of Forestry camp in Weott, California within spitting distance from the tallest tree in the world. In those days they called the camps the Ecology Corps. In the ‘70’s I founded and owned (with a partner) a commercial janitorial business, ran my mother’s newly inherited farm in Florin, and finally returned to Consumnes River College and then Sacramento State College in 1978 after meeting my wife Susan. "I was studying Geology when I was hired by a local geophysical surveying company to draft subsurface geology for clients and eventually to lead the field data acquisition crews in California. From there I went to work as a petroleum well-logging geologist for a Sacramento company called Energylog. I traveled to over 50 gas and oil wells in California and worked on-site sampling drill cuttings, analyzing them for gas/oil content, mineral identification, and sub-surface structure identification, and monitored many other well site data parameters as required. I was married to Susan Lawyer in 1980 on my mother’s farm where we lived. bought a house together in Santa Cruz (where Sutter Lawn stalwarts Nancy Mee, Peter Anderson, Carmel Sullivan, and my family had been vacationing for years). From 1986 to 1992 I was hired by an R & D company started by a Geophysics professor at Stanford as they needed someone who had well site experience to guide testing of their proposed “seismic-while-drilling” technology (“Tomex” was the eventual name coined for this tomographic exploration tool). I ended up helping them with proving that the system worked both on and offshore and in designing a system that was practical in the field so that it could be used by crews all over the world. After that small R & D firm was bought out by Western Atlas International, we agreed to move to Houston, Texas to their headquarters to get the process up and running as a commercially viable venture. I stayed in Houston as a Senior Development Engineer until the end of 1992 when I decided I’d had enough of gulf coast weather, and was ready to head back to California at all costs. "While I was with Western Atlas I was sent to many well sites onshore and offshore all over this country, and to sites in Venezuela and Scotland, and I supervised and supported geophysical crews in the US, South America, Africa, Indonesia, and the UK. While there I was named as co-inventor of a new device for measuring the seismic signal produced by a drill bit while drilling from surface instrumentation and this device was patented by the company. "After returning to Santa Cruz in early 1993, it was time for a career change, as I was tired of getting on a plane every time I went to work. I searched around for a while and finally settled on a job as a Process Sustaining Technologist at a Texas Instruments microchip manufacturing facility in Santa Cruz. I stayed there for 8 years before retiring in May of 2001 at the ripe old age of 50. All during these pre-retirement years my wife Susan worked as an electrical systems designer and we pooled our money to meet our financial goals. We never had any children by mutual choice. house and moved around the Monterey bay to Pacific Grove (details at http://www.pacificgrove.org). Dad was 82 and lived a full rich life. I moved my mom Connie into a board and care home in South Sacramento and she is aging gracefully and is receiving the care she needs. I call her nightly and visit once a month. "Just this year I’ve started a Celtic folk music concert series and hosted one concert each month both at our home and at larger venues. 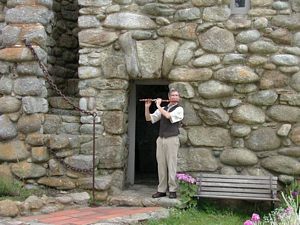 All proceeds go to the musicians, and it’s a great way for me to learn more about my hobby from the experts and to meet interesting people from all over this country and Ireland (the musicians usually stay overnight with us when they perform). 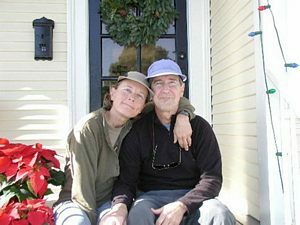 "The photo above is of Susan and me in front of our Pacific Grove home. Susan is very involved with competing in agility events with our two Australian Shepherds, and we have both kept in pretty good physical shape by running 6 days a week since the 1970’s. After almost 5 years, I think I’m starting to get the hang of this retirement thing. " - Marc Rush, Oct. 2, 2005. Contact info: (831) 333-1493. Peter Anderson – “I’ll never forget the summers when we lived at Sutter Lawn, riding my bike at 5:30 a.m. for swimming practice and sometimes thinking the coach was hungover. I went to UC – Davis and kept in touch with Billy Stillwell at SF State. “I joined the Cal-Davis swimming and water polo teams. I was a good swimmer – but not the best – and we did take second in the nation in NCAA Division 2. I graduated in Political Science in 1972, went to law school for a year and a half, hated it and dropped out. I went to work for the State of California shortly thereafter and have worked with the State Legislature for the last 20 years. Most of that time was spent representing the Governor and testifying before various committees. I was chief of staff for the Health Committee and also the Human Services Committee. “Basically, I evaluated health care and health insurance programs, analyzed legislation that would impact those areas and wrote statues. The key is that I’ve always loved that kind of work and very much enjoy politics. In September, I closed out my career with state government to become California State Director for the Pharmaceutical Research and Manufacturers Association. The job is great. I’m enjoying the new challenge and my new colleagues. I must say I did not realize how much the public dislikes and distrusts drug companies, which is quite unfortunate. However, their opinions can quickly change when they are sick and need drugs. Of course, some misguided politicians simply want to demonize drug companies to further their own climb up the food chain. 86-year-old father, Ralph. The Ellisons lived on 43rd Street, across the street from the Bettencourts, the Leonards (Doctor Leonard also died earlier this year) and the Fletchers. My family was very close to Ralph, who worked for my uncle and sponsored our family when we joined Sutter Lawn.” – Peter Anderson, Sept. 8, 2005. Bob Reid - "When I left that wonderful summer job at Sutter Lawn working alongside our great coach Buzz Nolan, I spent another year at college and graduated almost a year later. Took me five years to do a four year degree. I fooled around a lot in college but not in the traditional way. I worked in campus and state politics and my grades suffered. I was also active in my college fraternity, Phi Kappa Phi. "I went right to work in California politics working for the Republican State Party organization and spent most of the Reagan years as Governor in state politics. I managed a campaign for Attorney General in 1970 of a little known state senator, George Deukmejian. Deukmejian later became Attorney General and Governor. After the Deukmejian campaign in 1970 I went to Washington D.C. to work in the Nixon Administration at the Peace Corps. In between the politics, I spent the decade of the late 70’s promoting tennis around the Country with my own sports promotion company and took a turn as Manager of Sutter Lawn Tennis Club. It was a turn of fates and reversal of roles for me to hire the swim coach and supervise the swimming program at Sutter Lawn Tennis Club.
" In 1983 I joined the new Deukmejian Administration as Director of the Califiornia Arts Council and stayed in that job for the eight years that Deukmejian was Governor. In 1990 I had a series of life changes including getting divorced from my childhood sweetheart and fellow Sutter Lawn swimmer and lifeguard, Nancy Ledden, and I decided to become a Democrat among other changes. I have been working ever since in the Capitol often interacting with Peter Anderson who until recently was a major policy person with the Republicans in the Legislature. I now work for a wonderful lady Assemblymember Jackie Goldberg, Democrat from Los Angeles. in California politics and government until I am 70. I am envious of Buzz’s retirement but expect mine to be years off. I am in good health with a pacemaker keeping my heart on track and play a little golf about twice a month. "I have kept up with many of the parents of the 60’s team although they are dying off. In fact there are few parents living of that great team we coached pictured in this website. If you are interested in current Sutter Lawn news go to their website: www.sutterlawn.com." All the Best, Bob Reid. Oct. 18, 2005. Contact info: 916-319-2944. Beth Leonard writes, "I've been very BUSY lately. After 24-plus years at Bank of America, I 'retired' and started a new job June 16 as a VP/Commercial Lender at Irwin Union Bank, a fairly small, 134-year-old bank based in Columbus, Indiana. We have nine employees in Sacramento. So far, so good! I really like the change in environment. "Ed Schatz and I got married on June 18 in a very small, civil ceremony at a friend's home, with a judge-friend and two witnesses. My new legal name is Beth Schatz, though I'll stay as Beth Leonard at work for the time being. I moved the following weekend to Ed's home in Woodland, and put my home on 63rd Street on the market June 27. "Things are well for us. We've put our new home in Woodland (county seat of Yolo County) on the market and are building a home at The Rivers in West Sacramento. We expect the new house to be ready sometime in February. Hopefully we won't sell the Woodland house TOO fast, unless the buyers are willing to rent it back to us. I don't need or want an extra move! - Cheers, Beth. Nov. 13, 2005. Contact info: 916-505-2348. In January, 2006, Beth and Ed's holiday letter amplified on the above statement by saying that they had been "dating for 3 1/2 years, and became engaged at Christmas, 2004. We hope to have a Catholic wedding sometime later this year, but in the meantime we are extremely happy to be building a life together now. Following our marriage, I sold my home in Sacramento (and) we are awaiting the construction of a home in a new development in West Sacramento known as The Rivers. It's a gated community, being built on what was formerly a mature golf course property. There is lots of park remaining, into which we will have direct access from our backyard. fortunate to have eight siblings who, along with their familiies, are all supportive (whether local or not). We communicate frequently via email, and all contribute in different ways to our mother's happiness and well-being. She still has that wonderful, infectious smile. . .
"With so much activity, we (Beth and Ed, who is production manager in Woodland, CA for Switzerland-based Syngenta Seeds) haven't strayed far from home for long, though we've enjoyed a few short "getaways" to Maui, Palm Springs, Chicago, the Napa/Sonoma wine country, the SF Bay area and Williamsburg, VA in the last couple of years. Also, in the summer of 2004 we both managed to train for and complete a 100-mile bicyle ride around Lake Tahoe as a fundraiser for the Leukemia & Lymphoma Society. In 2006, we are looking forward to a reunion of my mother's side of the family in the Seattle area in August." Beth and Ed's new address effective about March 1, 2006, is 435 Westlake Drive, Sacramento, CA 95605-2561. Mike Leonard writes, "What a fun surprise to get an email from my sister Beth with a link to the site you have put together. I really enjoyed reading it. I don’t know if you remember me or not, but I’m the 6th Leonard in the nine sibling lineup. I was born in 1957 so was fortunate to swim with you and Bob Reid during the early 60’s when I was a little guy. In fact, Bob taught me to swim. I actually was also one of your successors in the 70’s, acting as assistant coach in 1975 and teaching many neighborhood kids to swim myself. I have great (and vivid) memories of those years at Sutter Lawn, and growing up spending summers swimming, lifeguarding, and teaching in that pool. "I loved hearing about everyone…many of the guys you mentioned were five or ten years older than I was, but I really admired them – names like Bill and Bob Stillwell, Marc and Scott Rush, Johnnie Whitlock, Pete Anderson, Nancy Mee, Charlie Stein, Tom Janvier, of course you and Bob Reid, and many more. You may not know it, but all of you made big impressions on the little guys like me at the time. It was special and I’m glad to hear those memories are still strong for you and many of them as well. "I have forwarded your link to a number of my SLTC friends (many of whom I'm still in touch with – in fact, I swim every day with an SL buddy even now). I expect the next generation of swimmers in the late 60’s at SLTC would love to contribute and read about their old friends as well. Those turbulent times and great friends we made shaped us all profoundly. Thanks for helping bring it back. record which we set in 1974. I think it’s the oldest one up there. SL 15-17 boys swimmers were pretty dominant in the league from ‘72-‘74 as each of us took a gold or silver in every event in the league. Dave and Mark are still close friends of mine…Dave is a local Masters swimmer and owns an advertising agency in Sacramento, and Mark’s in Dallas where he raised his two kids and now works in the office machine biz. Mark and I went to Cal Berkeley together in the late 70’s and did a little intramural swimming, but nothing serious…swimmers there were in a different league! Mark was head coach at SL from 1974 – 1978 (I was assistant in 1975 with him.) He put together some pretty good teams and was quite the legend at Sutter Lawn in the mid 70’s. It may have been ten years after you, but I’ll bet it was not too different from your and Bob’s experience. "Robert Lehee is another local…he also swam for Sac High with Dave and was part of those strong SL teams, routinely winning backstroke, butterfly, and freestyle events. He lives in Sac as well, where he teaches PE at David Lubin. "Mike Allen and I swam at Jesuit and at SL and currently swim every morning at RioDelOro. We recently completed a one mile ocean swim race (with Grant Heck – Arden hills and Jesuit) at the San Clemente Ocean Festival. I guess three aging aqua jocks just can’t seem to get competing out of our system… Mike has a local real estate appraisal business. "I recently moved back to Sacramento, where I’m working as the VP of Marketing and Entertainment for Cache Creek Casino Resort. After a year of my commuting back and forth to LV, my wife Lucyann and my two sons Conor (12) and Casey (4) arrived in Sacramento in August. We lived in Las Vegas for the past 15 years, where I worked in Marketing for Harrah’s and Caesars. Like you, I’m in the Communications business and even found myself in Memphis frequently at the Harrah’s corporate HQ on Cherry Road. It feels good to be back in the old ‘hood…we bought an 80 year old house on 47th and T street and are finally settling in." Best, Mike Leonard, Oct. 24, 2005. Contact info: Cache Creek Casino Resort, P.O. Box 65, Brooks, CA 95606. 530-796-5228. Barbara Fackenthall writes, "I have been slow to respond but don't get to the computer as much at home as I do at school. It was a kick to read the news and see the photos of some of the people I remember having so much fun with. I have fond memories of riding bikes to swim practice in the early a.m., going home to do chores and then back up 39th street again to spend the day at the pool - Johnny Cross the River, Hide the stick, the 100 mile swim and on a good day a dollar to spend at the snack bar. I also chuckle when I think of the dances on Wednesday nights after potluck, breakfast at Boyd's coffee shop and a marshmellow fight in Scott Rush's kitchen. "I still live in East Sac, near East Lawn cemetery and am still a Sutter Lawn Club member. So is my sister, Jill Fackenthall, who married her high school sweetheart, Dave Coffin. My oldest daughter, Heidi, swam on the swim team until she was about 16 or 17. She is a recent graduate of UC San Diego, taking some time off to figure out what is next. She called last night to tell me that she is most likely going to be assistant coach at Sutter Lawn this year. She, like me, also had lots of good times hanging out at the club while she was growing up. My youngest daughter, Molly, is 13 and never really got into the swim team thing. She could be a great little tennis player if she put her mind to it but seems to enjoy dance and team sports more. I keep threatening to drop my membership but still enjoy an occasional game of tennis. "I have been teaching prekindergarten at Sacramento Country Day School for 18 years and the amazing thing is that Robin Anderson's four year old daughter, Emily is in my class. She and her husband truly are "having a ball" playing with little Em who is a delight. I also see Janet Bettencourt quite a bit. We have remained close through the years. Her husband Gary and my late husband, Frank, were buddies. 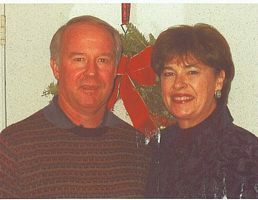 When updating the status of my life I have to tell the sad news of the passing of my husband in April of 2004. "It is obvious that I don't make changes frequently (still live in the same neighborhhood, worked for the same school for 27 years, still a Sutter Lawn Member) so this has been a huge transition. I have included an attachment of a letter (reproduced below) I wrote about a year and a half ago. The sentiment speaks to where we are. The girls and I are doing well, but Frank was an incredible person and we miss him immensely. The void left is an everyday presence. Frank Tash grew up in the pocket area of Sacramento and owned an automotive repair business in midtown for 25 years. He touched the lives of many people who appreciated his mom and pop approach to business. Many of his customers became friends. The following is from Barbara's beautiful and thoughtful letter after the April, 2004, passing of her husband, Frank Tash. "Dear Family and Friends, It has been four months since Frank's passing and I continue to struggle with an appropriate way to thank you for your love and support. Heidi, Molly and I have been overwhelmed by your kindness and generosity. You have sustained us in our grief and allowed us to embrace the past and look toward the future. Frank would probably say, that, because of your loving kindness, we are able to "KEEP ON TRUCKING." In that vein, he would want to express pride in the resilience demonstrated by his daughters as they carry on the torch for the Fackenthall Tash family. "Though it was a difficult decision, Heidi returned to San Diego a few days after Frank's service and was able to complete her last quarter of college. She graduated on June 13th and is now a UCSD alum. Several family members including grandparents, aunts, uncles and cousins spent the weekend in La Jolla to help us celebrate. It was an exciting time filled with many smiles and a few tears as well. We thought it was fitting that the first car we noticed as we left the ceremony was an Alfa Spider. It stayed with us along the coast until we reached our destination in Del Mar. While toasting Heidi at lunch her cousin, Brian, remarked, 'Heidi, your dad is watching. He would like to be here but he is over at the beach digging a hole.' (Frank always took a huge shovel to the beach and recruited a crew of youngsters to help him dig the foundation of his castle. It was probably his favorite thing to do when on a beach vacation.) Molly and I stayed on to vacation a bit after the weekend. She flew home on Thursday. "Molly dances and dances and dances some more. As well as continuing to HIP HOP, she is experimenting with Jazz and Tap this summer. I drop her off at 10:00 Saturday morning and pick her up at 3:00. She dances all day long, then comes home, drapes her lanky body over a chair and moans for ice cream or a foot rub. She adores her friends, her clothes, Johnny Depp and her bunny, Emma Bean. I adore her. She keeps a smile on my face even when she is testing my patience. Like her dad, Molly has a great sense of humor and spontaneity. She is always ready for a joke or a slice of fun. Recently when completing a survey on multiple intelligences, she noted, again to my good fortune, that she is good at taking things apart and putting them back together. "Heidi, Molly and I want to thank all of you for your outpouring of love and support. Some of you we see frequently. Others we have never met. Please know that if you are reading this letter you have touched our hearts and made a difference in our lives." - Barbara Fackenthall, August 2004." J. B. Cantrell - “J. B. Cantrell, 85, died Feb. 27, 2003 at Windsor Healthcare and Rehabilitation Center in Windsor, MO. He was born May 30, 1917, in Windsor, the son of George Henry Cantrell and Ollie Mae (Burton) Cantrell. On Dec. 9, 1939, he married Louise Alta Scogham, who died April 8, 1993. He was the tennis professional at the Carriage Racquet Club in Sacramento, California, for 12 years, manager and tennis professional at the Sutter Lawn Tennis Club, also in Sacramento, for 12 years. He also taught tennis for 5 years at the Golden Gate Park in San Francisco. He served in the U.S. Navy during World War II and was a member of the First Christian Church. He is survived by an aunt and several nieces and nephews.” – Obituary in The Daily Democrat newspaper of Clinton, Mo., March 3, 2003. William G. Stillwell: Native Sacramentian was noted expert in decision analysis in environmental cleanup field - "William G. "Billy" Stillwell, a nationally known expert in decision analysis who was born and reared in Sacramento, died of a massive heart attack during a gathering for his son's 14th birthday. He was 45. Stillwell, a championship swimmer when he was at Sacramento High, collapsed Dec. 3 at his home in Richland, Wash., and was pronounced dead a short time later, said his father, Franklin Stillwell of Sacramento. "He was employed at the Pacific Northwest National Laboratory at Richland, working under a Department of Energy contract to develop a risk-management plan for decision makers in the environmental cleanup field. At the age of 8, he began swimming at Sutter Lawn Tennis Club. He continued swimming competitively in high school and at Sacramento City College. "Anything he did, he gave it his all," recalled longtime friend John Whitlock. "He was a star all the way through high school. He could do all the strokes, but the butterfly was where he really shined. ...And he was a great friend." After attending City College for three semesters, he enlisted in the California Army National Guard, served six months active duty, then 41/2 years at a "weekend warrior," spending one weekend a month and two weeks every summer as a helicopter crewman. Meanwhile, he also pursued his academic interests, attending classes at Cosumnes River College, San Francisco State University and California State University Sacramento, where he earned a bachelor's degree in psychology in 1974. "Along the way, while working part time as a swimming coach at the Rosemont Swim Club, he met Lisa Crimmins, whom he married three years later. Leaving Sacramento State, he enrolled as a psychology graduate student at the University of Southern California, where in 1981 he earned a doctorate in quantitative psychology 1981. "He was popular ... and easy to work with," said Mark Hanson, his boss at the laboratory in Richland. "And technically he was very sound. He knew what he was talking about." "In addition to his wife, he is survived by son, Sean, 14; a daughter, Sara, 12; his parents, Franklin and Lillian Stillwell of Sacramento; and a brother, Dr. Robert Stillwell of Stockton. A memorial service will be conducted at 11 a.m. Saturday, Dec. 30, in Fremont Presbyterian Church, 5770 Carlson Drive, Sacramento." - Obituary from the Sacramento Bee, Dec. 13, 1995. Written by Bee staff writer Steve Gibson.